An ISIS-Loving Muslim Said "Death To America!" 5 Seconds Later, He Got DESTROYED! In our society, one of our most cherished and protected rights is the freedom of speech. That means that no matter what you say and how offended people get, you can say anything you want under our Constitution. It’s what makes this country great and it’s what allows our dissent of the government to be heard by our readers and viewers. It’s one of the most important rights any free people can have, and it’s being encroached by Sharia. There’s no better example than this exchange between free speech advocate Pamela Geller and radical Islamist Imam Anjem Choudary. Just to give you an example of what you’re about to see, this is what Islam truly is: an ideology of a totalitarian regime that wants to control your every move, including thought. If you dare defy it, they’ll kill you. You know what? She should be tried in a Sharia court, be found guilty, and of course she would face capital punishment. She should have thought about that before she had that competition. You can’t go down that road, insulting Muslims, and think the Muslims aren’t going to retaliate back. I would attack someone if they insult my mother, let alone the prophet who I love 100 times more. 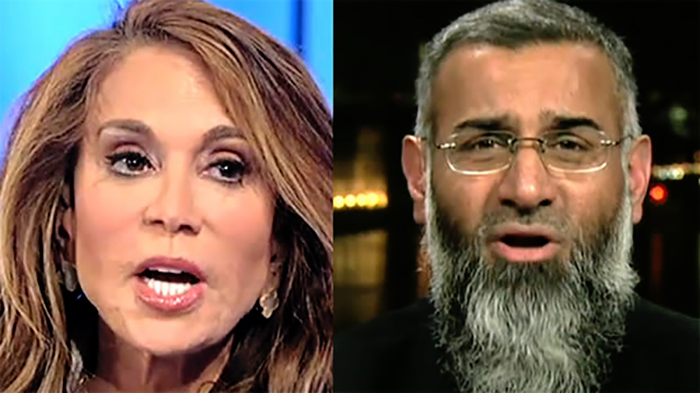 Here is the CHILLING video, with Geller’s awesome rebuttal to Anjem’s pure evil.